...GET IT SHIPPED Free Auto Shipping Quote: 1966 Plymouth Belvedere Convertible 440 Big Block 727 Transmission. 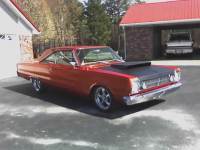 ...GET IT SHIPPED Free Auto Shipping Quote: 1966 Plymouth Belvedere -2 door. V-8 engine. 3 speed manual on collar. 58,700 miles. Clean title.